According to the local press, the head of the Algerian Intelligence and Security Department (ISD) General Mohamed Mediene, the true mastermind of the Algerian politics widely known by his nickname “Toufik” is seriously ill. 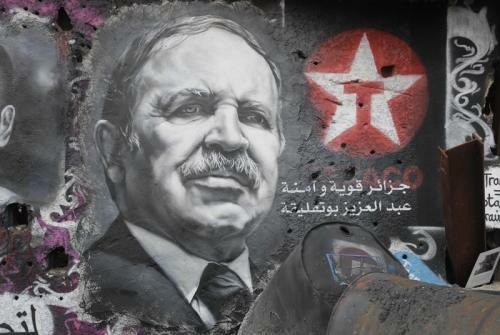 This can erode the current balance of powers in Algeria, since the political vacuum occurred due the absence of the sitting president Abdelaziz Bouteflika, who’s been fitting a serious disease since April, is deepening. What makes the matters worse is the absence of a charismatic leader on the political horizon, that can replace the president. The head of ISD has been the dominant power broker in the country for twenty years. He has managed to devise an underflow network of clans and unions which granted him the title of the most powerful man in Algeria. Toufik has also managed to collect profiles of all the prominent politics that has ever achieved a noteworthy rank. The cunning, caution tactician Mohamed Mediene has been manipulating Algerian presidents since 1992, when the military executed coup d’état to prevent radical islamists from obtaining majority in the Parliament. And for those who dared to doubt the power of Toufik, the assassination of Mohamed Boudiaf became a “good” lesson. Due to the state of political uncertainty in Algeria, some experts believe, the United States decided to “deploy a crisis-response force for Africa to an air base in Spain”. This may be a sign of the inescapable change of power that is bound to happen. The US forces, as the official source claims, would be charged with evacuating foreign citizens from Algeria if things turn from bad to worse. General Mediene has not only become a vital link between different enforcement agencies, he took control over different market flows, including the fossil fuel assets going in and out of the country. Without his direct control over this department, the dogfights for the most profitable contracts among the members of the local elites will become commonplace. This may give way to the reinforcement of the local opposition and radical Islamists, including those that found refuge in Libya, Tunisia and the Sahara-Sahel area. If the security in Algeria is to deteriorate fast, the destabilization may spread across the whole North Africa region. Toufik played the leading part of the Algerian involvement in Mali, along with the shaping of policy towards Tunisia and Libya, in the post-revolution times. He was the one who said that Algeria must support France in Mali, he was the one to initiate investigation on Bouteflika’s involvement in the cases of corruption in the Sonatrach petroleum company. The declining health of once mighty head of ISD will affects the support that Algeria provides to the Western secret agencies in their fight against Al-Qaeda. In the absence of the young political figures that can acquire the presidential responsibilities, the shift of generations, that will leave the ruling Oujda clan along with the Toufik’s military elite overboard, promises no good to this African country. For sure the confidants of Bouteflika the Prime Minister A.Sellal and the advisor to the President M. Kamel Rezag Bara doing their best to show that they are in control of the situation. But everybody understands that Bouteflika can leave the Office on any other day. This air of uncertainty forces the possible candidates for president to act. The strongest of the all – the former Prime minister Ali Benflis. He takes no immediate action but there’s a distinct activity in his party headquarters. The National Liberation Front – the ruling party is not doing well since the head of party the former Prime Minister as well Abdelaziz Belkhadem have recently resigned. Yet another candidate found himslef in the center of the heated discussions – The speaker of the Council of Nation – Abdelkader Bensalah. If the President is to pay his debt to nature or unable to carry out his capabilities, than, according to the Constitution, Abdelkader Bensalah must take his position till the new elections are appointed. But there’s a demand that a President must be Algerian born, and the media is insisting that the speaker of the Council of Nation was born in Morocco. So nothing is sure in Algeria today, since there’s a lot of things that can trigger a crisis. The only savior, as it goes in many countries, is the army, which can hold on the feeble status quo.